Every James Bond film except Dr No starts with an iconic pre-titles action seqeunce. Which are the fan favouites? Since 1963 and “From Russia With Love”, the pre-titles have been known for their action, adventure and most importantly, the spirit of the James Bond pictures. Of all 20 adventures, Dr No was the only film without pre-title sequence. MI6 now presents the first of a series of articles entitled"Fan Favorites", covering all aspects of the Bond canon. 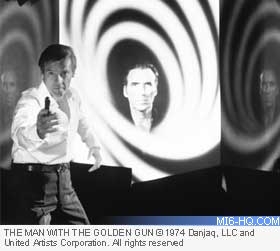 In late 2005, MI6 polled its forum members, and dedicated Bond fans, to discover the fan favorite pre-title sequence. James Bond (Sean Connery) infiltrates the enemy’s base and plants plastic explosives to destroy the goods. He then makes his way to a local bar where 007 casually waits for the explosion and returns to romance a local star. In her dressing room, Bond is attacked by an unknown assassin who he “shocks” with a combination of a bath and an electric heater. 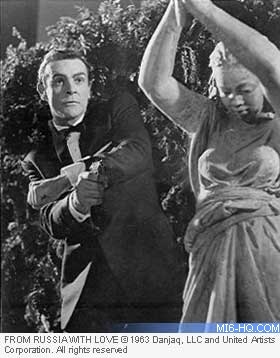 James Bond (Sean Connery) enters the gardens at night and is hunted by Red Grant. Grant strangles Bond and it is revealed that it is not 007 afterall, but another victim with a Sean Connery mask. The part of Boiter, the man whom Bond fights in the pre-title sequence after disguising himself as his own widow, was played by sunt coordinator Bob Simmons. Before the widow gets punched, the part is played by Rose Alba, explaining why "his" legs look so good in a dress. Bond (Sean Connery) and a French agent attend the funeral of a villain. 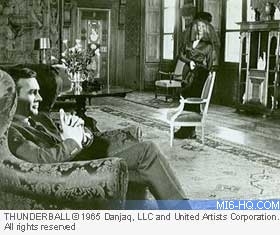 Bond identifies it as a fake and spots the villain dressed as the widow. He tails him back to his house, “unmasks” the traitor and they fight. Bond successfully disposes with the villain after wrecking bookcases and chairs. 007 is chased by some thugs to the rooftop where his jetpack awaits. He escapes to the tune of the Bond theme, and to the trusty DB5. In the opening moments we see Bond (Sean Connery) romancing a Chinese lady but shortly after, assassins break in and shoot Bond “dead”. After the titles, we next witness the navel ceremony and the burial at sea. A stuntman had his nose broken by Lazenby during one of Lazenby's fight screen tests while he was auditioning for the role of Bond. After Lazenby broke Borionko's nose Bond co-producer Harry Saltzman told Lazenby, "We're going with you." 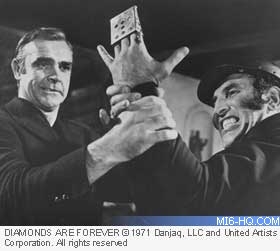 James Bond (Sean Connery) is out the revenge the death of his wife. That means killing Blofeld! He tracks the SPECTRE leader down after “persuading” a few thugs, and near strangling a girl with her own bikini. Blofeld is arranging plastic surgery, and has yet again changed his physical appearance. Bond battles "Blofeld", eventually tipping him into a boiling pool of mud. We witness the deaths of three British men. A delegate at the United Nations, an agent in San Monique, and a man succumbs to snakebite in a voodoo ceremony. Bond is not present. An unknown man arrives on the island to collect a pay-off and Scaramanga (Christopher Lee) lures him into his “Fun House”, place of many illusions. The assassin, Scaramanga, uses the fun house as practice and hunts the other man though its many rooms. The hunt reaches its climax and Scaramanga kills his target. In this final room we see a mannequin of James Bond (Roger Moore). The island used as filming location for the Scaramanga's beach house (Phang Nga Bay, Thailand) is known as "James Bond Island"
James Bond (Roger Moore) is romancing a woman in an alpine cabin. He soon receives a message from his “ticker-tape” watch and has to return to HQ. He leaves and gets chased by a crowd of Russian thugs on skis. The chase unfolds and we find that Bond his heading for a steep cliff with no other escape. 007 jumps off the mountain and freefalls before opening a parachute that bares the Union Jack. An “in-transit” space shuttle is hijacked and stolen. 007 (Roger Moore) is called back to HQ but the pilot and hostess of his private jet turn against them at the will of Jaws. The villain destroys the plane's controls and prepares to parachute. 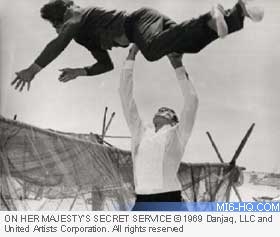 Bond attacks the pilot in hand-to-hand combat and ends by throwing him out of the plane. Jaws knocks Bond out without a parachute and follows after. Freefalling, 007 manages to wrestle the parachute off the pilot and onto himself. He falls safely to the ground. Bond (Roger Moore) visits the grave of his wife and is interrupted when a “Universal Exports” helicopter lands to rush him to an emergency. In the air an electric shock kills the pilot and Blofeld is now remotely controlling the helicopter from his wheelchair. The chopper is flown throughout the chimneys and warehouses of industrial London and eventually flown into a dead-end warehouse. Meanwhile Bond manages to swap places with the pilot and just manages to gain control before the helicopter, pick up Blofeld – wheelchair and all – and dump him down a chimney. 007 teams up with a female agent to infiltrate an air base and plant a bomb. Disguised as a high-ranking officer, Bond plants the device but comes face to face with “himself”. With the help of his ally and her good looks, 007 escapes in his Acro-star Mini Jet. However, the news of his escape soon causes more trouble and a heat-seeking missile is launched to shoot Bond out of the sky. He shakes it off by flying back thought the air base hanger and as the door closes the Acro-star slips thought but the missile doesn’t. Bond escapes, the job successful after all. Bond (Roger Moore) is out to recover a microchip from the body of a dead 00-Agent. Finding the agent is easy, but escaping the clutches of the Russians proves a challenge. 007 is spotted while searching the body for his prize and is set upon by the Russian agents on skis, on snowmobiles and in heliccopters. 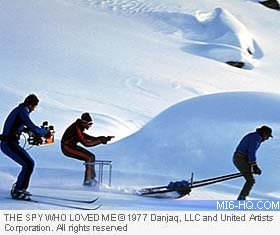 The chase commences, but skis are not enough for Bond. He chases down the snowmobile and defeats the driver easily. There is, however, still the helicopter to contend with. The chopper fires at Bond and the snowmobile, destroying it, and 007 barely escapes. Bond resorts to using the remaining ski from the snowmobile as a snowboard. Bond escapes to the Beach Boys’ “California Girls” with tongue firmly in cheek. James Bond (Timothy Dalton) and other 00-Agents are on a training mission to Gibraltar. They parachute into the security complex, but what was training, becomes a disaster. An imposter Agent is in their midst, and has already assassinated two of Bond’s allies. 007 is soon on the assassin’s tail, but not before he causes some serious damage and makes his escape in a nearby Jeep. Bond dives on board the moving vehicle at the last moment and battles this assassin for control of the Jeep. During the battle the Jeep swerves off the road an over a cliff, falling for the water. Bond pulls his parachute and shoots clear of the vehicle, leaving the assassin doomed. Felix Leiter is on his way to his wedding in the Florida Keys, accompanied by his best man, James Bond. News breaks that the DEA's (who Leiter now works for) most wanted man Franz Sanchez has strayed in to US territory to retrieve his mistress. Leiter and 007 - acting only as an "observer" go after Sanchez, first on the ground and then in the air. 007 captures Sanchez's plane by attaching a line from their coast guard helicopter, just before the pair parachute down to the wedding. Bond (Pierce Brosnan) bungie jumps off a dam to the bottom where he infiltrates a Chemical Weapons Factory. 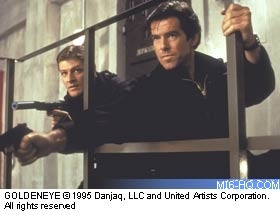 Meeting up with Agent 006 (Sean Bean) they infiltrate the facility and begin to plant bombs. They are found out and 006 is held at gunpoint. He is shot, and 007 barely escapes. Bond commandeers a bike and races after a taxing plane. 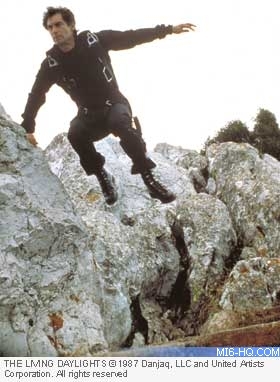 Disarming the pilot but nearly diving into the cliff face, Bond eventually takes control of the plane and escapes. The teaser was filmed at the Verzasca Dam in Locarno, Switzerland. Stuntman Wayne Michaels performed the spectacular bungee jump, it was the highest bungee jump from a structure in a movie. The drop was over 722 ft. He and also did a second, shorter jump for use in close ups. 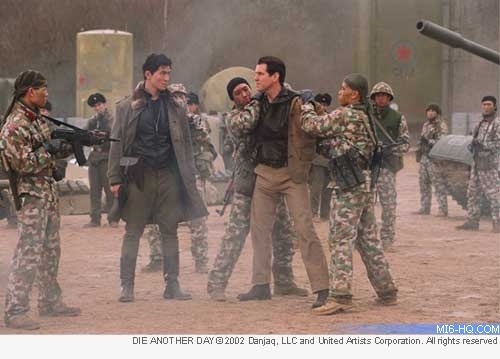 007 (Pierce Brosnan) infiltrates a terrorist arms bazaar, near the Russian border. 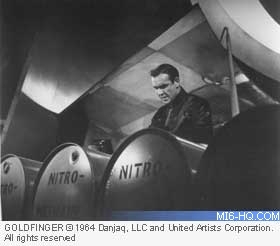 Upon spotting a jet armed with nuclear torpedoes, Bond charges through the market wreaking havoc, capturing the plane and flying it to safety before the missile hits. Bond prevents the radioactive plutonium being spread across the area. James Bond (Pierce Brosnan) visits a banker in Spain to recover a caseload of money, but the meeting is cut short when the banker is subject to an assassin’s “sights”. 007 escapes the clutches of the police and returns to London only to find that the money he has recovered is packed with explosives. When the explosion goes off, 007 spots the same assassin as she flees the scene. Bond utilises Q’s latest invention, the Q-boat, and begins to pursue the assassin up the Thames. The chase ends when the assassin takes to the air in a hot air balloon. Helicopters surround the balloon, and the assassin takes her own life. James Bond (Pierce Brosnan) surfs into North Korean territory accompanied by two other agents. They capture a helicopter on it’s way to a meeting with Colonel Moon. Posing as the South African diamond dealer, 007 infiltrates the base. Soon, however, he is identified and narrowly escapes on board hovercraft. A high-speed hovercraft chase launches 007 into the demilitarized zone. The chase ends when Moons craft takes a plunge into a fast flowing river. Holding 007 responsible for his son’s death, General Moon, captures and tortures Bond.